I was stunned to realize the other day that I've never posted this dear old friend pasta. Now that we're all supposed to be joyously embracing the Mediterranean diet, this almost conforms, bursting with fresh tomatoes, peppery arugula and bright, fresh lemons and garlic. It iis really only inappropriate because of the heavy cream, oh, and the cheese. Never mind, it's SO good and easy for any old weeknight, that at least I always take comfort that there's no artery clogging meat in it. My pal Ina came up with this killer recipe in her 2006 cookbook, "Barefoot Contessa at Home". The original recipe calls for 2 CUPS of heavy cream, so I've amended it to be much more sensible with a scant one cup--still sinful I suppose, but so worth it. I recommend you make it with whole wheat pasta and comport yourself as though it's truly healthy in order to, as my mother would say, "draw a veil" over the sordid truth of that cup of cream. I mean really, I've seen plenty of Mediterraneans indulge in all sorts of worse things, and goodness knows, I still love them just as much. 1 pint grape tomatoes, halved. Bring a large pot of water to boil for the pasta. While it's coming to the boil, heat the olive oil in a medium saucepan over medium heat. Add the garlic, and cook for a minute and then add the cream, the zest and juice of the 2 lemons and salt and pepper to taste. Allow to simmer while you cook the pasta and until it starts to thicken. 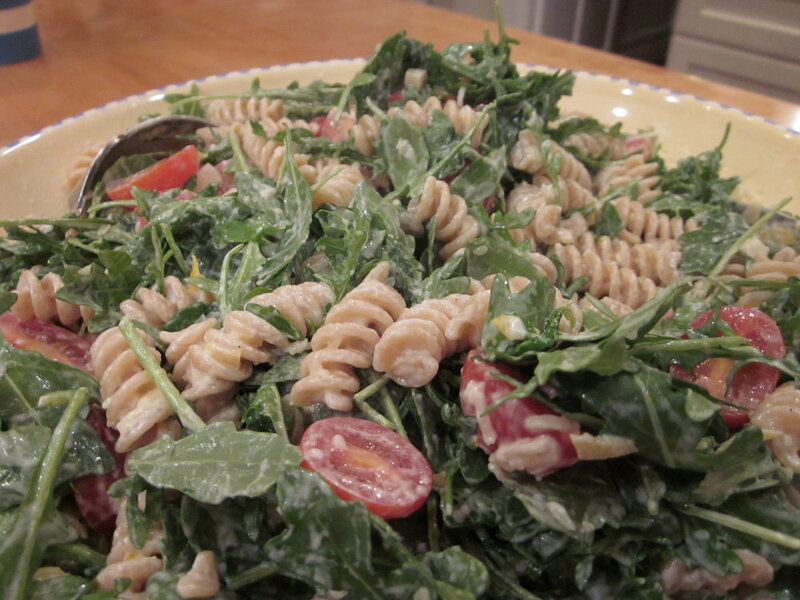 In a large pasta serving bowl, combine the arugula, tomatoes and the cheese and set it aside. Cook the fusilli until al dente for 12 minutes. Reserve a cup of the pasta water and then drain the pasta and return to the pot. Immediately add the cream mixture and cook over medium-low heat for 3 minutes, until the pasta has absorbed most of the sauce, adding a little of the reserved pasta water as necessary to ensure a moist pasta. Pour the hot pasta over the arugula mixture. Toss well and serve immediately with additional cheese and a pepper grinder.